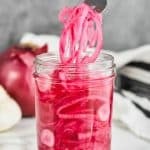 These Quick Pickled Red Onions only take 5 minutes to make! They are delicious, simple, and the perfect compliment to so many different recipes! Pack the sliced onion into a mason jar with the sliced garlic. Whisk together the hot water, vinegar, salt and sugar until the salt and sugar are dissolved. Cover the onions in the water and vinegar mixture. Cover the jar and let rest for 30 minutes. Enjoy or store in the refrigerator for up to 4 weeks.